Situated on Yuasa Bay, 20-some kilometers south of Wakayama City, the town of Yuasa boasts an historical preservation district that is significant both for religious pilgrims and for aficionados of Japanese cuisine. As a coastal town built between the mouths of two rivers, it has clearly been significant for trans-shipment of goods, but from the earliest days of the Kumano Kodo pilgrimage route -- a thousand years ago -- it was also a resting place for pilgrims, before they made their grueling trek through the mountains. Depending on the route chosen, some modern day pilgrims also transit Yuasa. Yet for the past 760 years, Yuasa's greater claim to fame is edible. Yuasa is said to be the birthplace of soy sauce in Japan. The story is that a priest returning from China introduced miso paste to Japan, and someone in Yuasa realized they could produce soy sauce as a by-product of the miso paste production. While soy sauce, that ubiquitous ingredient in Japanese cuisine, is now produced in various places across Japan -- including mass production in modern, stainless steel facilities -- to really appreciate the condiment, Yuasa is the place to go to learn about its origins. The town once boasted over 90 soy sauce breweries, although only four remain today. The oldest part of the town is a labyrinth of narrow streets and traditional wooden buildings, some centuries old. Since 2006, the area alongside a small shipping canal on the south bank of the Yamada River has been designated as an "Historic Industrial Town." 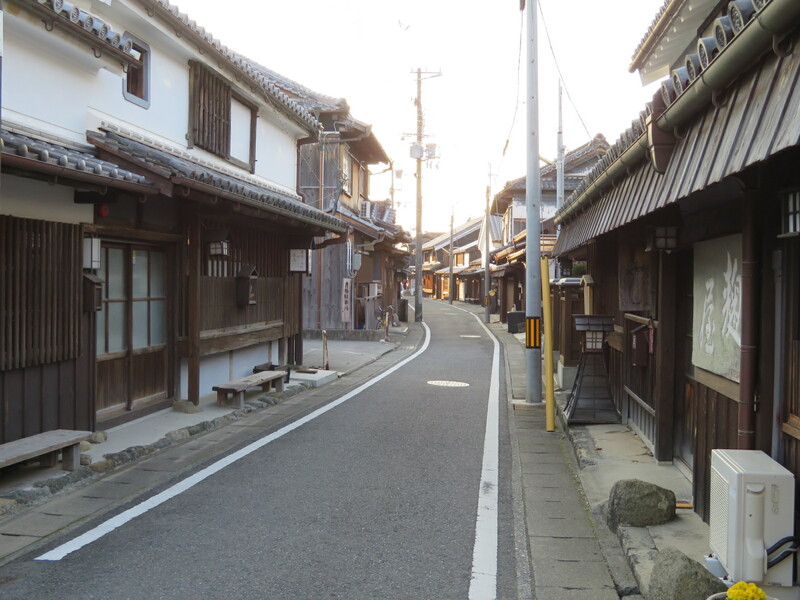 Just a few hundred meters from Yuasa train station, it is a quaint neighborhood to meander, soaking up the atmosphere while enjoying the architecture of the preserved buildings. Various window treatments, wall construction, and roof tiles offer visual delights and arouse curiosity. Nearly everything in the area seems to relate somehow to the production of soy sauce or miso paste. Depending on the time of year, one can even smell soy sauce in the air. 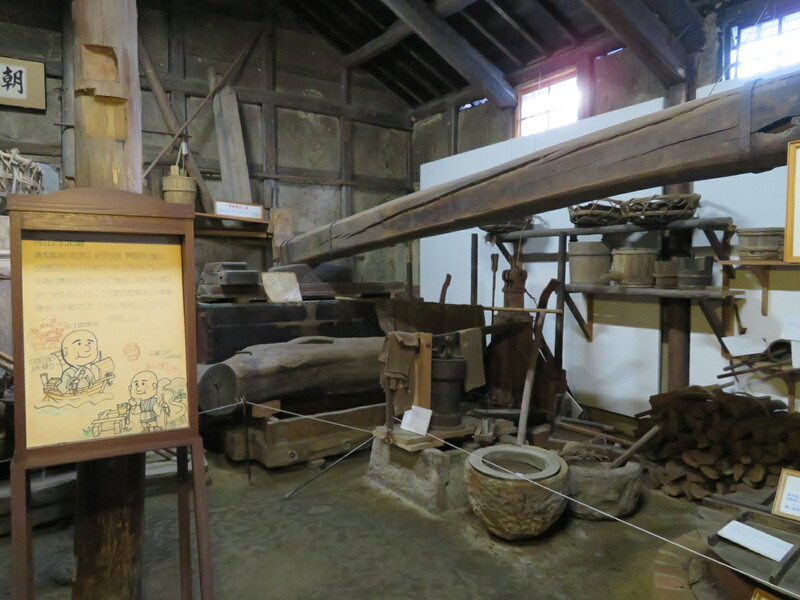 Step into the Kadocho Soy Sauce Museum (open daily, 9 a.m. - 5 p.m.; admission free) to enjoy their rustic exhibits of the tools and equipment used in soy sauce production. If some items resemble the ones used in sake production, it should come as no surprise. After all, both are fermentation processes. Be sure to try out soy sauce-flavored ice cream, as well. Or maybe just find someplace for a lunch of sushi fresh out of the bay, suitably seasoned with soy sauce made in Yuasa. Actually, not everything in the preservation district relates to soy sauce. 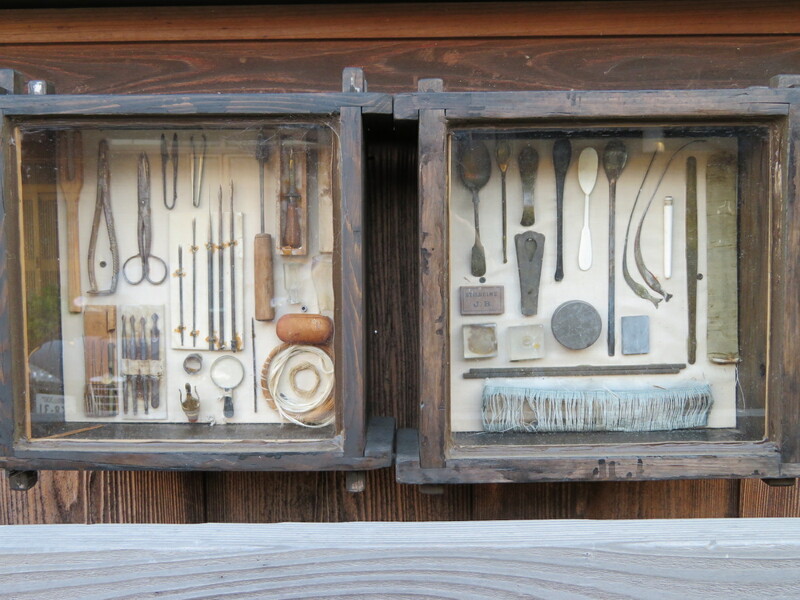 Many of the old buildings display small "shadow boxes" containing antique tools related to the occupation of the original inhabitants. Some buildings now house boutiques selling local produce or handicrafts, making this a fun place to just wander and browse. Of course, there are a few small, local temples to check out. Be sure to look for Jinburo, the old neighborhood bathhouse, too. To learn more about the current production of soy sauce in Yuasa, pay a visit to the Yuasa Soy Sauce Factory, located about a 15 minute walk northeast of the train station. (Hours: 9 a.m. - 6 p.m. daily except at year-end/New Years). 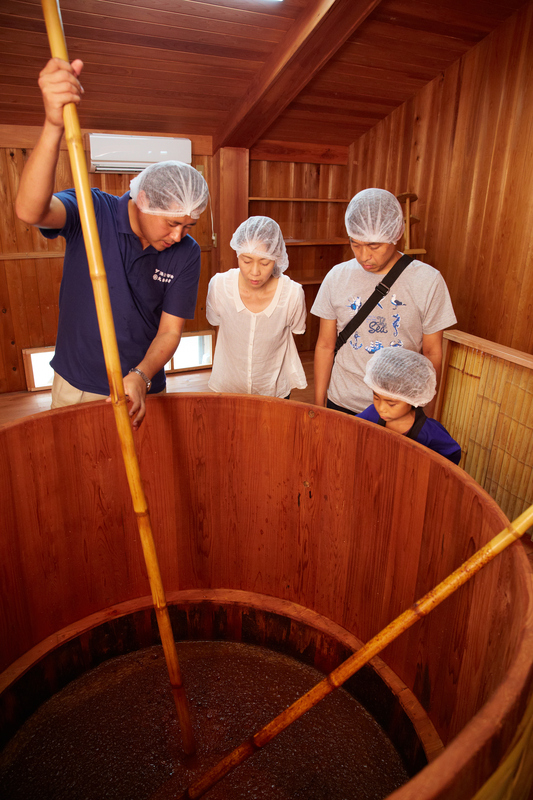 Housed in a relatively new building that has been built in the Edo-period style, and operated by the same family for four generations, Yuasa Soy Sauce Factory offers visitors free tours of their production facilities (reservation recommended). 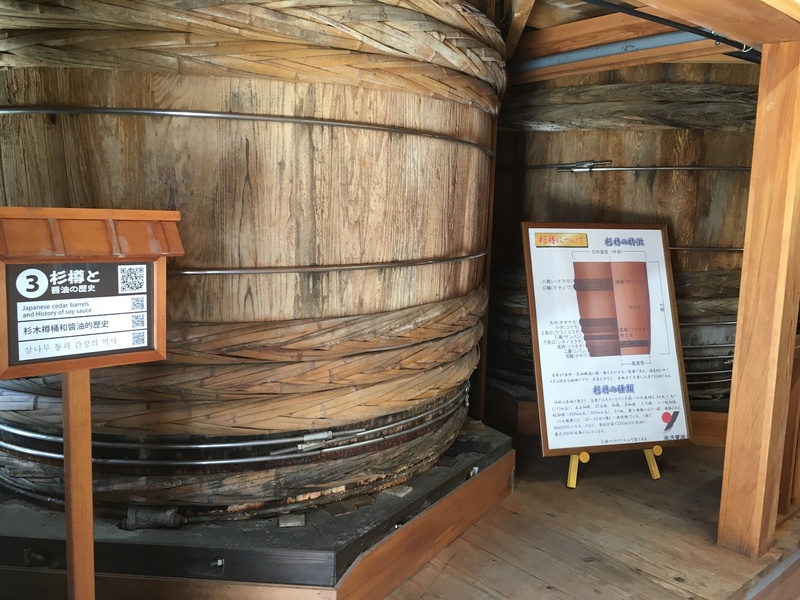 Visitors with smartphones can scan QR codes to get English language explanations (free wifi available) as they view the traditional wooden barrels in which the various ingredients are blended and prepared and observe the entire production process. It is quite interesting to learn how black soy beans are steamed and then rested, then blended using traditional wooden barrels with malt, salt, local mineral water, and other key ingredients and left to ferment. One point emphasized on the tour is the traditional methodology employed -- a process requiring more than 18 months to complete. This is in stark contrast to modern methods that process the ingredients in metal and reduce the fermentation time to less than six months. Although unrefined soy sauce needs to ferment (at this factory, it is fermented for 12 to 18 months), the mix also needs to be stirred regularly. Here, that process is done manually. 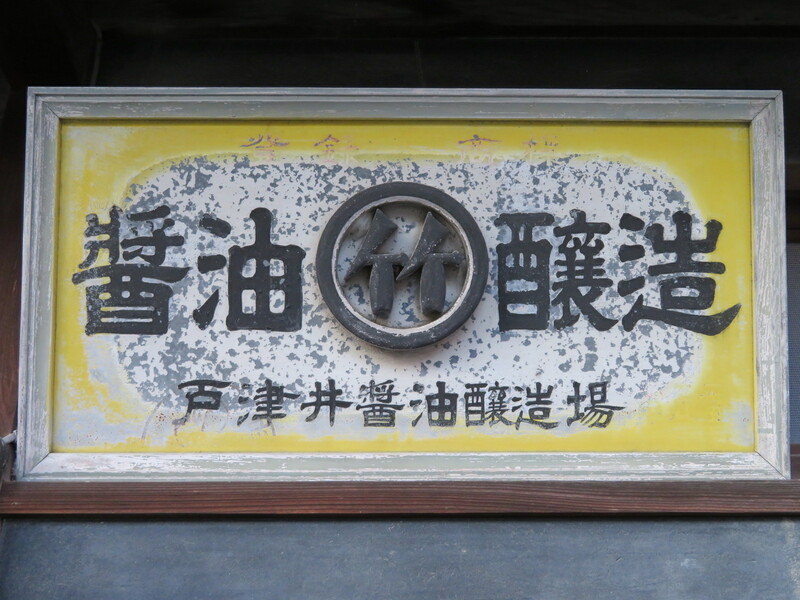 Visitors can don a happi coat and other traditional factory wear and participate (300 yen) in stirring the unrefined soy sauce with huge paddles, a chance to experience a bit of that traditional methodology that makes this product so special. The Yuasa brand of soy sauce is an award-winning brew that is much stronger than more commercial brands. This is particularly interesting given its location in western Japan, which is known for preferring more delicate flavors. The guide explains that Yuasa's position as a port enabled it to export its product by sea to eastern Japan, where the preference is for the more full-bodied sauce. Yuasa soy sauce was, and apparently still is, especially popular in old Edo (present day Tokyo). It is said to particularly bring out the best in sashimi. Of course, there's a gift shop where you can buy the award-winning soy sauce and many other related products, including varieties of soy sauce, locally produced miso and pickles, and, of course, more soy sauce-flavored ice cream. Yuasa even makes a halal version of soy sauce from which even the trace alcohol usually present in soy sauce has been removed. One leaves armed with knowledge and feeling like an empowered gourmet ready to try out lots of new uses for soy sauce as a condiment. 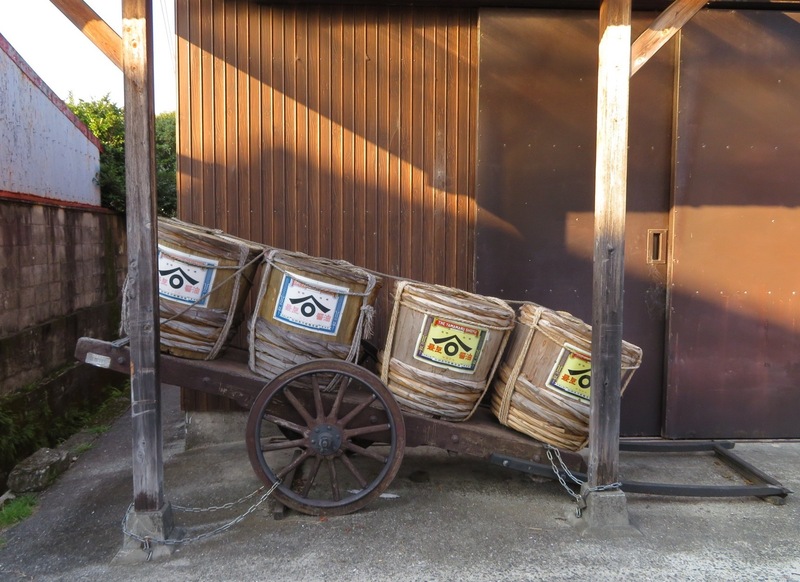 Although the preservation district is small and easily walkable, to facilitate a visit to the Yuasa Soy Sauce Factory visitors can borrow bicycles for free at the Yuasa train station (8:30 a.m. - 5 p.m. daily). Yuasa is a relatively easy day trip from Osaka or Wakayama City, but for those who have the time, there's lots to see and do up and down Wakayama Prefecture's west coast or inland along the Kumano Kodo pilgrimage route. For something really different, consider overnighting at the Yuasa Onsen Yuasa Castle, a hot springs hotel in the foothills behind Yuasa that looks like an Edo-period castle. Needless to say, the meals served there feature Yuasa soy sauce and miso paste!